Bravo Supermarket is a chain that operates in various locations, mostly in the northeastern United States, including New York, New Jersey, and Connecticut. They also have several locations in Florida. They sell an array of products including fresh produce and cater to much of the Latino population. The Bravo group was founded in the early 1990’s and they wanted to bring the New York shopping experience to those in Florida. Whether this was because a lot of people from New York moved to Florida and the company wanted to give them a taste of home, or whether it was because New York is the shopping capital, therefore a New York shopping experience is a powerful statement. They worked together with their already established sister company, C-Town Supermarkets. The fourth and fifth stores were opened in Orlando as opposed to New York. At the time, Orlando was flowing with Hispanic New Yorkers, therefore the company was already known by many people and targeted at the Hispanic market. For these reasons, the store was an instant success and paved the way for several more to be opened. If you walk in to one of these stores, you can shop for Goya beans, listen to Latin music and see potted palm trees. Sixteen stores in total were opened across Florida, briging authentic Hispanic ingredients to the community. This would not have been possible if it was not for Krasdale, the supplier, agreeing to supply their produce outside of New York. The stores range from small stores at 7,000 square fee to much larger stores at 25,000 square foot. This means that the stores are sized between the tiny bodegas’ in the area and the giant superstores. In 2008 a branch opened on the northside, because they took advantage of the gap in the market for a good supermarket with an inbuilt pharmacy. Other services that this new store offered include custom cuts of meat, a deli and a department full to the brim of fresh produce. Its difficult for me that do not drive to get to the other stores in Orlanda and else where. I like krogers. So naturally I love bravos. Would love a store to be opened in Cocoa, FL. We travel all the way to Palm Bay or Orlando. There’s an open shopping center (used to be Winn Dixie, they moved) across from Publix on SR 524. About a 15 min drive from me still, but better than 45 mins and traffic to Orlando. Would also love to know what brand rice they use at the restaurant. It tastes so good! Had to go to this dump on xmas day for a last minute item. I don’t eve shop there for a good reason. This store had bags of fully moldy cheese on the shelf for sale. Disgusting. I am looking for employment. If you need a cashier for sunset strip, call me. My number is 954-256-3821.
today I went to the new store in daytona beach and was very disappointed (drove 5 miles one way). after waiting 6 months for it to open, I went in to buy something and was treated very rudely by an employee. Basically was told that I did not matter since they were other customers more important than me. For everyone reading this, I suggest you do your shopping at the Placita Supermarket on Mason st in Daytona Beach. They are more friendly and their food is less expensive and taste better. A the store at Nova was a great diappointment. I just can’t believe you would say such a thing about this store. But as always we look for people like you. This was what you call a soft opening and at times nothing will go right especially when you look for something to go wrong. We can’t wait until the new store opens in Daytona Beach, does anyone know yet? We go by every weekend to see if there is a sign stating it but nothing yet. year ago I requested a bravo supermarket in palm coast,fl. we have a very large latin community. Most of us go to your orange city store to shop.We did not get one in Palm Coast but we are excited about the store you are opening in Daytona Beach,Fl. it is much closer to us.No more travling far. I have been spreading the word around because a lot of our people don’t know about the Daytona Beach store.Please donot change anything in the store keep it the same as the others Thank You for our new store.Maybe in the future we will get one in Palm Coast. I agree, I also live in Palm Coast and can not wait for the Daytona Beach location to open!! Do you know if this store in Daytona is already open? I also live in Palm Coast and I’m excited for this store. I agree I was living in Poinciana fl. where there was a bravo.. no problems did I have.. now I have transferd with my job to santarosa beach fl.. n there is no bravo…. theres is a latin store butttt they don’t carry what I like…… please we need a bravo in this area n p.s wallmart here is not the same… very small …. Today I went into Bravo Supermarket in Long Island. When myself and my partner arrived to the store the STORE MANAGER and a Team Member from the Dairy Department were having a HOMOPHOBIC laced rant directed at me and my Partner. IT IS FOR THIS REASON I WILL NEVER SHOP AT BRAVO. CONSUMER BEWARE. The store was Disgusting, The Property was Disgusting. The appearance of the employees was disgusting. I WILL NEVER SHOP AT A BRAVO SUPERMARKET AGAIN. THE WORST. NO BUENOS. Bravo supermarket on 4261 Broadway, a youg lady casheer with attitude, unprofessional with no courtesy at all, after she made a mistake. Ordered one case of ting three weeks ago,Still not in called store no answer phone rings 25 times.buddy wants a case,they have my phone number be nice to get a call.and tell me something.Thanks P.S. store is in ocala fla.
Bravo 1331 St. Nicholas Ave (2120 9271331 would NOT take my coupons because they could not scan them. That store was reported to 311 and they lost a valuable customer. 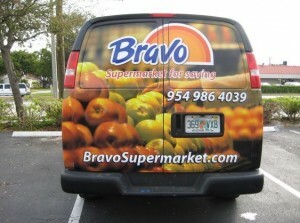 the bravos in florida & orlando are the worse supermarkets in town. i was excited to see one because i come from ny. however, i bought meat one time and it was my last. the meat was way pass the expiration date. they must have put a new date stickers and fresh red liquid to make it look fresh. i bought 8 egg custurds (flan) and the date was not to expire in a few days. when I opened the container they all were growing mold. the bravo in orlando, i happened t experince the same problem with the meat. if you buy can goods you can get those real cheap. green bannanas, paltains and most of the roots are fresh. otherwise go someplace else, this one will kill you.